Did you know, we provide On Site and Off Site Dublin Shredding Services on a weekly basis? Our Mobile Shredding Unit is based in Dublin every Thursday and we would be delighted to get consideration for any Shredding work that you have. Why not call today and receive a quote with no obligation. For an On Demand Shredding Service, we can have the bags and cable ties delivered free of charge, within two days of your request. For a Regular Dublin Shredding service we offer Secure Shredding Consoles free on loan. These consoles are securely locked and can only be opened by a trained member of our team. By using a Professional Shredding Service you are eliminating the risk involved with your confidential documents. 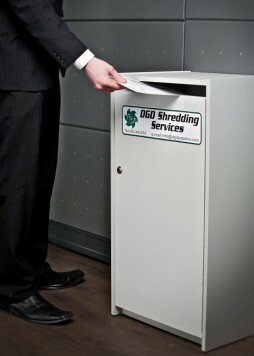 DGD are one of the largest and longest established Shredding Companies in Ireland. All our staff are fully trained and Garda vetted. All vehicles are slam locked and fitted with a tracking system. We can charge by Bag, Box, Bin, Weight or even Time if required. For more information on all our services please call 1850 491 333.